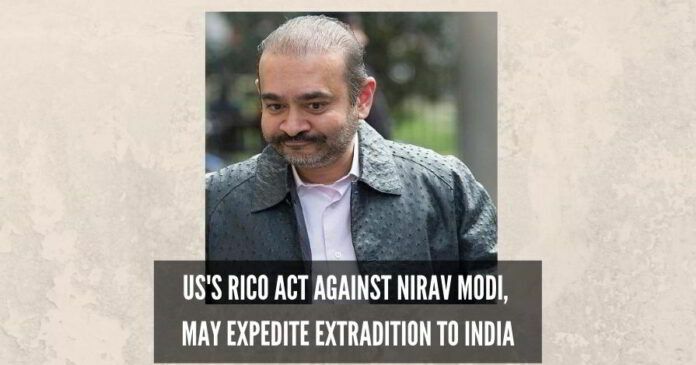 Home Politics Corruption Nirav Modi to be extradicted to India under US’s RICO Act? Nirav, Bhansali and Gandhi could face up to 20 years in prison if convicted under the RICO Act. Fugitive diamantaire Nirav Modi has been charged with violating Racketeer Influenced and Corrupt Organizations (RICO) Act in an American bankruptcy court. This could pave the way for his speedier extradition to India according to reports. Modi is currently in Wandsworth Jail in the UK and is currently undergoing extradition proceedings. Three companies linked to Nirav – Firestar Diamond International, A Jaffe and Fantasy Inc – filed for bankruptcy protection in the United States of America (USA) in February 2018. ED believes that if Nirav is faced with this possibility, he may not contest India’s extradition request as aggressively as he is now according to the reports. A court-appointed trustee probed the companies and a complaint was filed against Mihir Bhansali, CEO of Firestar Diamond and Fantasy; Ajay Gandhi, a senior executive in all three companies; and Nirav. The trio was accused of breaching fiduciary duty, aiding and abetting breach of fiduciary duty, corporate waste, and violations of the RICO Act. “The case in the US is also linked with his [Nirav’s] scam in the country,” a media report said quoting ED source. Nirav is the prime accused in $2 billion Punjab National Bank (PNB) fraud case. The maximum punishment Modi would face in India is seven years’ imprisonment under the Prevention of Money Laundering Act (PMLA). While Nirav, Bhansali and Gandhi could face up to 20 years in prison if convicted under the RICO Act. ED believes that if Nirav is faced with this possibility, he may not contest India’s extradition request as aggressively as he is now according to the reports. Modi’s bail plea was rejected for the second time by London’s Westminster Magistrate court on March 29 rejected. The next date of hearing is April 26 as fixed by the judge. For the next hearing, Modi will appear via video link from jail. Previous articleWho has the upper hand in the most populous state of India? Next articleWhich famous Indian company was the offset beneficiary that Christian Michel mentioned in his handwritten note? Are Roys the benami owners of NDTV? Is Reliance Industries in Control? Is the PNB Fraud Just the Tip of the Iceberg? Bank Loan Scam is the biggest scam – of all the scams committed by Congress thieves – right from Nehru to Manmohan. There are sufficient indications suggesting the involvement of Raghuram Rajan – as a facilitator. All of them should be taken into custody & intensive interrogation should be performed.